Are you getting enough sleep? This plan is for adults who are struggling to find restful sleep. Get your sleep back on schedule with my NEW Four Week Program! Within four weeks, I advise you on a path towards a great night's rest. This program includes personal phone calls, emails, and interactive sleep logging designed to overhaul your old approach and refine your new bedtime routine. Even though adults don't need as much sleep as little ones do, sleep is still extremely important to your overall health and well-being. Sleeping well means that your mind, body, and spirit are able to function at their maximum potential and allow you to be the best version of yourself. Great sleep provides many great benefits that affect your health, your job, your relationships with others, and your overall outlook on life. Private, 60-minute phone consultation – During this consultation we will review your sleep plan in detail. We will discuss sleep strategies, troubleshoot possible challenges, and learn how to address issues that are causing you to not sleep through the night. Detailed, customized sleep plan prepared for you. Four weeks of working one-on-one with me, Katie. Four weekly follow-up telephone calls while you are implementing your sleep plan. These calls are designed to address your progress and any setbacks you may be experiencing. Four weeks of email support to answer additional questions you may have. ​Sleep log template specific to your plan and goals. You will complete this each day; it includes detailed analysis of progress made. This helps us focus on measurable progress and results! "I started getting insomnia when I was pregnant but it didn't go away after I had my baby and he started sleeping through the night. I finally contacted Katie because for 2 years I was having trouble going to sleep at bedtime and staying asleep in the middle of the night. I was pretty miserable some days because I would go many nights in a row without getting a good night's sleep. I was also constantly sick probably because I wasn't getting the sleep that I needed. I was skeptical that a plan would work for me since I already knew a lot about sleep and I had pretty good habits. But Katie was able to identify some areas for improvement, and I was ready to make some changes so I could start sleeping well again. Now after working with Katie, I fall asleep easily at night and I'm able to go back to sleep most nights if I wake up in the middle of the night. I feel amazing now that I sleep well most of the time. It makes such a difference to feel rested every morning. Thank you Katie for your help and for making my life so much better!" After living years with undiagnosed severe sleep apnea, I finally received my diagnosis and started using my CPAP machine. But even then, I still wasn't sleeping great. My schedule was off and I was always tired. I decided to try to Solve My Sleep with Katie, and I feel like my life has changed. Not only do I have a better relationship with my CPAP machine, because lets face it, who really wants to use one, but I have a better relationship with sleep. My schedule is on track, I feel much more productive at work, and my relationship with my family has improved. I no longer feel temperamental, impatient, or stressed out as I used to. This was certainly one of the best investments that I could have made for my health and well-being. 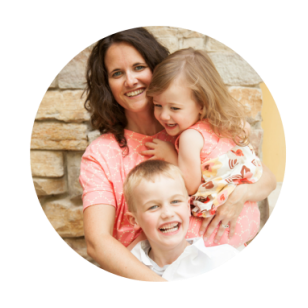 Katie has been personally trained by Dana Obleman, the founder of the Sleep Sense™ Program which has helped over 57,000 parents worldwide learn a quick, gentle solution to their little’s sleep challenges. If you are ready for a plan that is easy and clear to follow and help you sleep through the night, this is the plan for you! Getting your littles to sleep may seem like a big investment, but I guarantee the results will be beneficial to your health and contribute to bringing more happiness to your family. If you're not sure if a sleep consulting package is for you, no worries! Let's get on the phone and chat in a free consultation where I can help you decide if this is right for you.